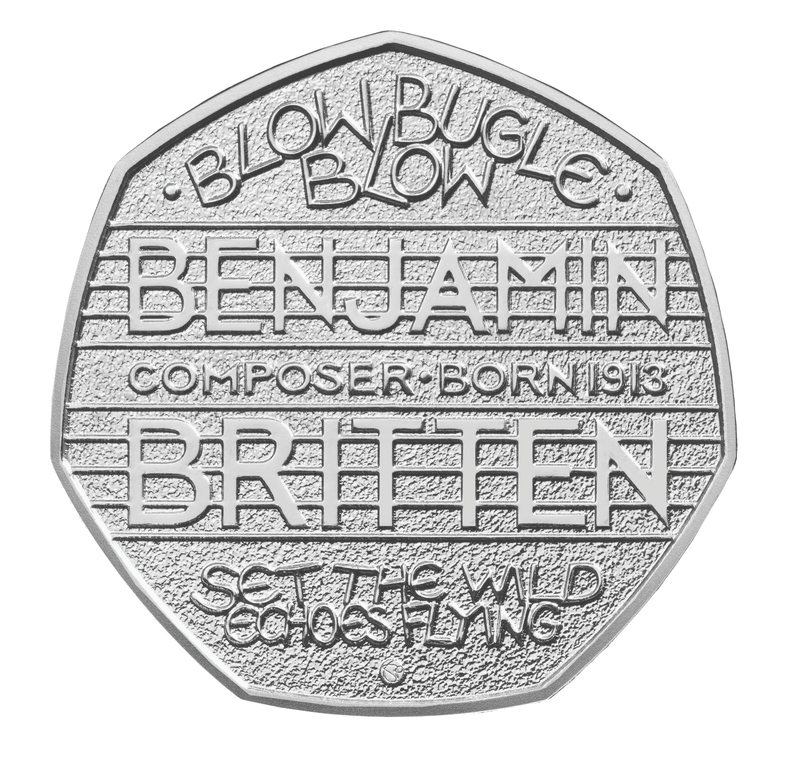 The coin celebrating Benjamin Britten's centenary was unveiled this morning, with a design by Tom Phillips. Benjamin Britten is set to be the first composer to feature on a British coin, thanks to a new coin commissioned to mark the centenary of his birth. The design, unveiled this morning, is set to come into general circulation later this year in time for the anniversary itself, on 22 November 2013. The design features words by poet Lord Tennyson words "Blow Bugle Blow" and "Set the Wild Echoes Flying", set to music by Britten in his Serenade for tenor, horn and strings. Rather than a the composer's head, or a design featuring well-known scenery from Britten's home town, Aldeburgh, designer Tom Phillips has framed the composer's name in a double musical stave alongside the lyrics. Coin collectors looking for a slice of musical history can expect a presentation folder, complete with reproductions of his sheet music and information about the composer's legacy. Uncirculated commemorative versions in gold proof and silver proof will be available from 27 September.